I hope the start of 2010 has been good to all of you so far. 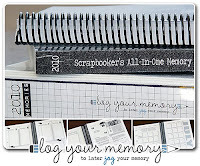 It's about to get a little better for a lucky few as it is time to announce the winners of a few prizes by the generous donations by Kristin Rutten at Log Your Memory! Congratulations to Jodi, Tina and Annette!! Please watch your inbox for further details on how to claim your prize!